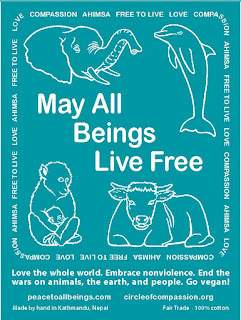 Peace to All Beings: "Irresponsible Gods" or Happy Humans? "Irresponsible Gods" or Happy Humans? “Irresponsible Gods” or Happy Humans? As activists, we see evidence of this everywhere, both in history and in the present. Some of Harari’s possible future scenarios for our species are chilling, but we would not be activists if we did not believe that human nature can change, indeed that human beings can wake up and stop our destructive behavior. 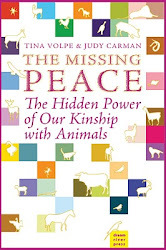 His book is important, I believe, because he demonstrates how the many different horrors we have unleashed upon each other, nature, and animals are all connected by a common root. That root is the relentless desire for more pleasure and power by an all too clever and anxious animal. As Robert Sommer stated in his “The Real Death Star” article regarding ExxonMobil, “facts don’t interest them. Money and power do.” Reading on we learn, in Craig Volland’s article about the new hog factory in Greeley County, that Seaboard Foods got a permit to add 132,000 more hogs to their operation. Added to their other 330,000 hogs, the waste from these factories will be “equivalent to a city of one million people.” But a city of that size has a sophisticated sewer system—right? The hogs? No sewer system required. Instead open air lagoons receive the endless flow of contaminated poop ruining air quality and threatening all the water sources nearby. And there may not even be enough water in the aquifer to support this expansion. This is clearly another example of the clever, anxious, and way too powerful human animal gone mad—dangerous, dissatisfied, irresponsible “gods,” as Harari would describe them. And the prairie dogs! Elaine Giessel’s article alerts us all about the dangers they face and the losses they have incurred. Ninety percent of prairie dog towns have been destroyed, often for the sake of cattle ranchers who claim they compete with cows for grass, in spite of some science that shows otherwise. So much suffering and death has been caused to these gentle creatures, other wildlife, and the cows themselves so that ranchers can make a profit. Yet while it is easy to blame Big Ag, Big Pharma, Big Oil, Big everything, we know that pitting us against them is missing something. In the Big Picture (so to speak) we are all connected. We have many of the same characteristics of seeking pleasure and wanting to be in control of our world. We are all homo sapiens. While some may be extreme psychopaths and others may be saints, nevertheless, we must each face what we contribute to the mess humanity as a whole has made. If we eat pigs, we are contributing to the profits of Seaboard, a company that makes no attempt to care about the environment, people’s health, or the massive suffering of pigs, who are at least as intelligent as dogs and just as capable of emotional and physical pain. If we eat cows, we contribute to the poisoning of prairie dogs, overgrazing, loss of wildlife habitat, species extinction, the air and water pollution of feedlots, and the profits of slaughterhouses. If we eat chickens, fishes, or any animals, our money brings profits to those who are killing them and ravaging the earth and the sea. If we buy dairy products and eat eggs, we help those farmers cut the lives of cows and chickens short and take their babies from them, all the while contributing to further degradation of ecosystems, water and air quality, and our own health. As I mentioned in my column in the Winter issue of “Planet Kansas,” trying to help by buying “humane” meat, dairy and eggs, leads nowhere. Most of the labels are false, as we are now learning from investigators of Whole Foods “humane” farms and others. They are, it turns out, factory farms with meaningless labels. And even the local farms in which animals actually have a little room to play and lie down (although you don’t know for sure unless you visit one), the animals still must eat much more grain than they give up through death in a pound of their flesh. If pressed to be honest, most “humane” farms will admit that there is no possible way for all human beings to eat the quantity of meat they want if animals are not factory farmed. That is simple math. There is not enough pasture for the animals and not enough land on earth to grow their grain and hay if they were all to be raised outside of cages. Of course, even on these small, local farms, the animals are killed, and “humane killing” is an oxymoron only a clever homo sapiens could conjure up. Harari speaks of us evolving into what might become a new species, but not necessarily one that we might want to be. He acknowledges that we have the capacity to find happiness through meditation and rise above our relentless pursuit of pleasure and avoidance of pain. But, as science-without-ethics races forward at breakneck speed, inserting worm genes into pigs to make pork seem healthier, working to computerize human brains, inventing an endless list of drugs promising pleasure, he questions which path we will take. We are at a cross roads. As activists, I think we all feel that very strongly. We know how destructive our species has been, and we know human beings are equally capable of taking either road. We work in all our individual ways to help evolve our species to become nonviolent and nurturing in our relationship to life and the earth. But we are also aware that we could evolve, as Harari warns, and become even more devoid of a sense of justice, kindness, and responsibility. We will carry on and keep doing what each of us is called to do at this critical time. When people see a large group behaving in a new way, a way that nurtures life, it helps them see that it is possible to leave the old ways behind and still survive. It took many people living without slaves to show that families could survive and prosper without causing immense tragedy to other families. Craig Wolfe’s article shows us how powerful it can be when we switch to solar and cut way back on fossil fuels, for example. By doing those things, we normalize them and help people see that it’s not weird or crazy. And, best of all, we demonstrate what ordinary people can do with or without the help of governments. We can personally refuse to support the companies that are destroying people, animals, and the earth. Of course, as I always point out in my columns, the most massive change each one of us can make is to stop supporting the animal agriculture industry that survives for only one reason—people buy their animal products. Imagine the benefits to every life form on earth, including homo sapiens, if animal agriculture became a thing of the past, and eating a plant-based diet became the norm. As we know, growing animals for food is intrinsically linked to deforestation to grow feed and farmed animals; desertification; horrifying pollution of all our seas, rivers, creeks, aquifers, air, and land; unprecedented species extinction; use of fossil fuels to grow and transport feed, to transport animals to feedlots and slaughter, to heat and cool huge farm buildings, and to transport packaged products to stores. The next time we see a truck on the highway taking pigs to a distant slaughterhouse, let us imagine that one truck multiplied by all the other trucks doing the same thing at that very moment. Imagine the fumes polluting the air, the oil spills that took place before the truck drivers filled up their trucks at the last truck stops, and the destruction of habitats and wild animals that took place to drill for the oil. Imagine the amount of fossil fuels that would no longer be needed if all those trucks (and ships) all over the world were no longer needed to transport for animal agriculture. We can educate; we can demonstrate with our own lives; we can bring hope, and we can say that the earth and the animals will one day no longer be in danger from “dissatisfied and irresponsible gods who don’t know what they want?” As we learn to develop our own inner peace and live, eat, and celebrate “as though the earth matters,” we can become, not dissatisfied “gods” but joyful fellow beings sharing and caring for this precious earth we all call home.